We feel that it is crucial for any Sysadmin or IT professional to have quick access to, and information about any given networked device in their environment. Having a centralized platform where you can get specific details about each monitored device will greatly reduce troubleshooting time by being able to access and get critical information about it, or even finding the malfunctioning device. We will focus on cisco devices for this post and what type of information is available to user’s. 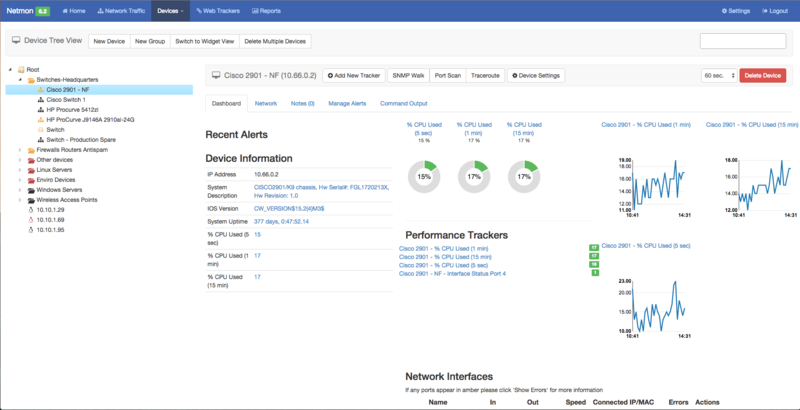 In Netmon we have created dashboards for cisco and other specific (the most popular and common) manufacturers so that when a device is added, it automatically polls “dashboard” or preset trackers. 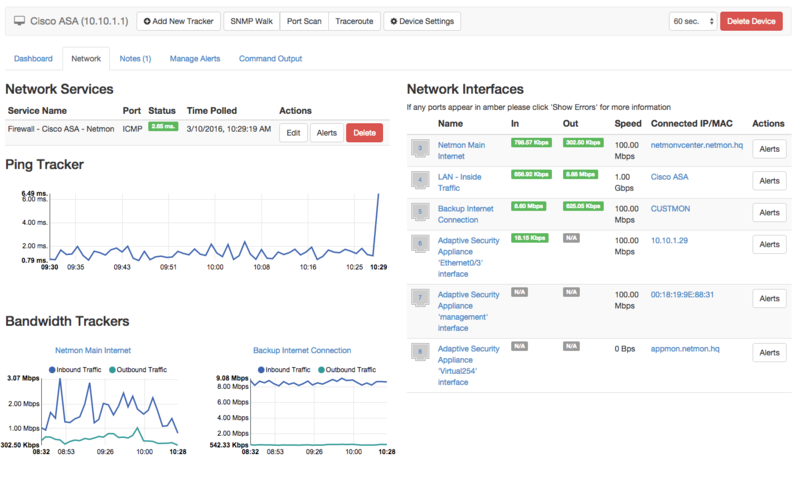 Additional trackers can be added to the dashboard using SNMP walk. Netmon utilizes several industry standard technologies including PING / ICMP, SNMP, NetFlow that come into play when talking about cisco devices (you will have to have SNMP enabled on the cisco device before you can add the device into netmon). The dashboards will look very similar for the family of cisco devices with a few notable differences that we will point out. When adding a new device in Netmon you will need to enter the device’s information such as IP address and SNMP configurations, polling interval, etc. Here is what the default dashboard looks like for a cisco switch, in this case a 2901. You will notice that this dashboard provides you with crucial system information about the switch including its CPU % utilization, System Uptime, Description, etc. You can quickly identify and establish the status of the switch including the load it’s experiencing on a 5 second, 1 minute, and 15 minute average. This would quickly tell you if the switch is overloaded. This information that you are seeing is in real time, or rather, last poll data (if your interval is set to 3 minutes, it means that data is current as of 3 minutes - that is our default log level for regular monitored devices). 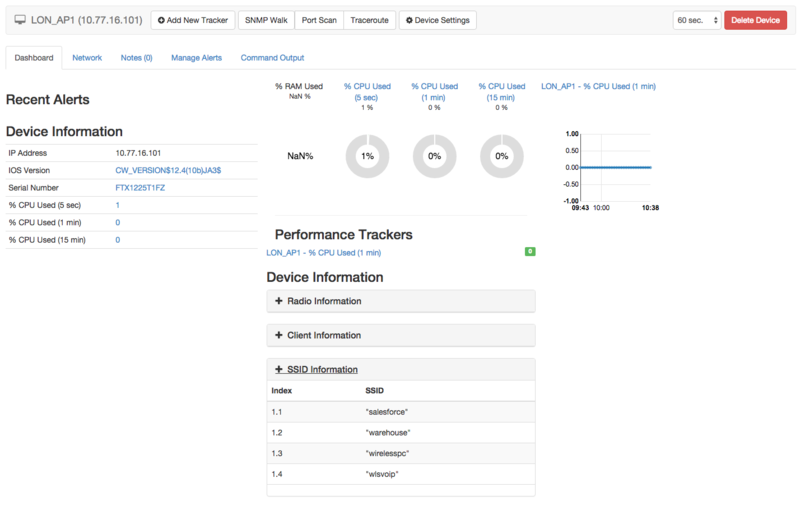 If you require additional information on the dashboard that may be accessible through SNMP on your device, you can add it by running a SNMP walk and selecting to “graph / log” OID tracker you wish to add. In order to track any of these items on the dashboard historically (rather than view the last poll, for reporting purposes) you can create a tracker out of any of these items that are listed on this dashboard. This will give you the ability to run a historical report - for example, what was my CPU % utilization for this device last week? Because this is a switch, we are going to be interested in the network interfaces that are on this switch - navigate to the “Network” tab in the device’s dashboard. On the right hand side of this tab you will see every single interface, physical or virtual, along with the bandwidth in and out as well as what is connected in that specific interface (this will either display as a resolved name, IP or MAC address). These fields can be renamed and customized to your liking. As mentioned above, this is real-time (last poll data) and in order to track bandwidth utilization across one of these interfaces, you simply create a tracker and tell it to “graph / log results”. We will come back to this in the firewall section a little further down this post. On the left hand side you will find PING / ICMP and TCP trackers and just below it you will find Bandwidth trackers. Again, once a tracker is created it gets stored in Netmon and you are able to run historical reports for any given timeframe. Most of the dashboard for the cisco devices are going to look very similar to each other in terms of the information they provide with the exception of a few added features depending on the device in question. 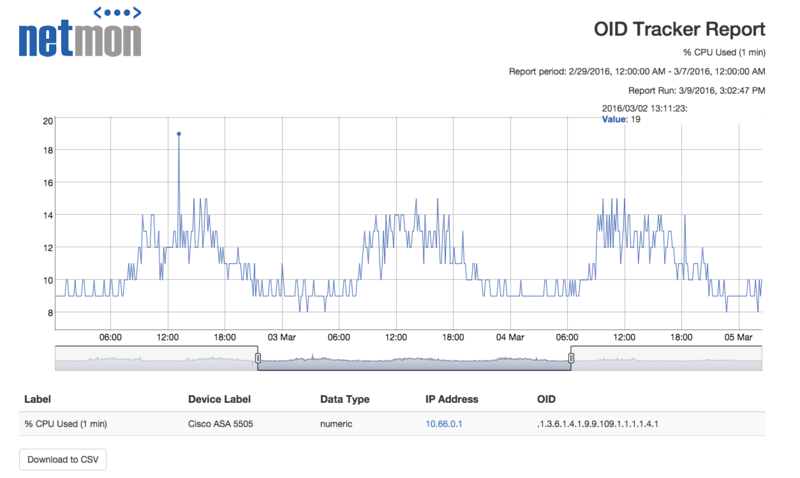 For example for cisco firewalls we have a little more information available on the dashboard. Cisco firewalls give us the addition of % RAM used and give us VPN Session information right on the main dashboard. This is very useful if you need to see what’s configured and who’s actively connected. As mentioned above for switches, when we go to the Network tab of the firewall we can access all our bandwidth trackers, PING / ICMP Trackers. Cisco WAPs will once again give us more or less the same information as well as the addition of specific Device Information - Radio, Client and SSID broadcast. 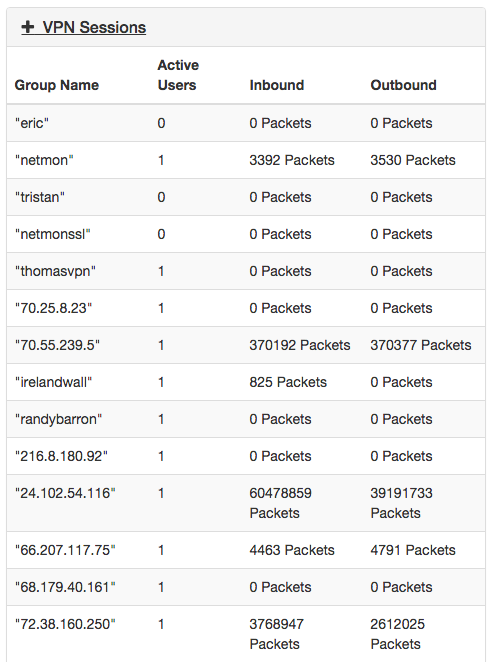 This lets you easily identify what group / mesh and location this WAP belongs to. Again, more of the same information can be obtained, tracked and reported on, with a very similar look so that everything is quickly and easily accessible for information gathering, troubleshooting or checking up on. From here you can create parameters and thresholds and be altered anything that exceeds these thresholds. 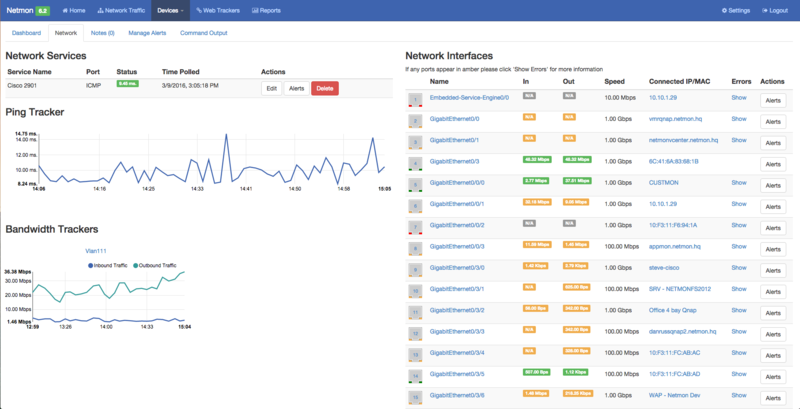 You can even import SYSLOG information into netmon for each device so that is also accessible, reviewable and of course ALERTABLE on. 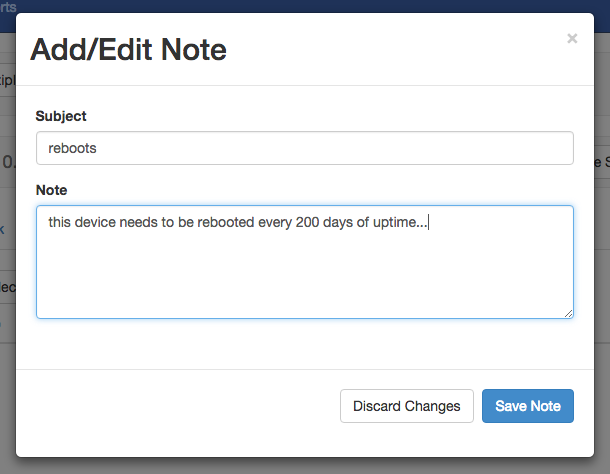 Each device dashboards also contains a “notes” section where you can log any events or information about this device in text form.